This almost circular route traverses part of The Upper Tweeddale National Scenic Area and includes a stretch of the Southern Upland Way. Starting from Peebles, you travel close to the source of the River Tweed before turning east through some of the Borders’ most impressive scenery. Start your day with a spectacular view, before visiting one of the world’s finest arboreta. Take a dramatic scenic drive and experience the remoteness of the landscape. As you drop down into the Yarrow Valley you’ll be greeted by lochs that perfectly reflect the hills that rise all around you. Take a moment to climb a pele tower, before completing your day at a former hunting lodge for kings and queens. From Peebles take the A72 west towards Blyth Bridge. After 1 mile/1.6 km you’ll see a car park signposted for Neidpath Castle on the left-hand side. Continue west along the A72 for a further 3 miles/4.8 km and then turn left onto the B712. The entrance to Dawyck Botanic Garden is 4.3miles/6.9 km on the left. There is plenty of car parking, a café, toilets and a shop on site. From Dawyck, continue southwest along the B712. After 3.4 miles/5.4 km turn left onto the A701 and follow the course of the River Tweed southwards. After travelling for 6.8 miles/10.9 km, look out for a minor road on the left signposted ‘Talla Fruid’. 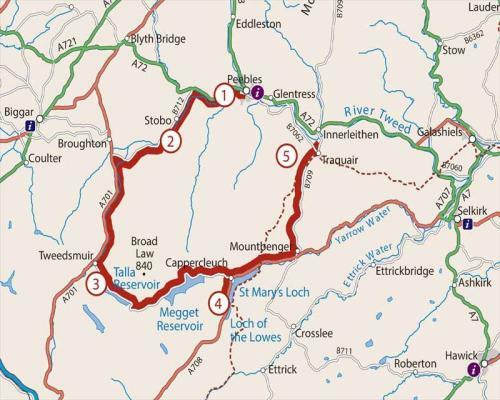 Take particular care along this undulating single track road with passing places; it continues for 12 miles/19.2 km and has several steep climbs and descents. St Mary’s Loch and the Loch of the Lowes, where you’ll also find public toilets. From the car park turn right and retrace your route back along the A708. After 3.9 miles/6.2 km you’ve the opportunity to visit the 16th century Dryhope Tower; entry is free and it’s one of the few ruined ‘pele’ towers that you can climb as an internal staircase has been installed. Park in a lay-by on the left just past the entrance to Dryhope Farm. A short distance along the road, follow the Southern Upland Way uphill to the tower. From the lay-by continue for 2.3 miles/3.7 km, then turn left at the Gordon Arms Hotel onto the B709. Continue for 7.1 miles/11.4 km before turning left onto the B7062. The entrance to Traquair House is half a mile/0.8 km further on the right. The view of Neidpath Castle from the banks of the Tweed is stunning. The castle is not open to the public, but the view should not be missed. From the car park, take the steps down to the river and turn right towards the old railway viaduct in the distance. As you turn to go back, the view of this 14th century, L-plan, rubble-built tower house is spectacular. Framed against the skyline and the surrounding trees, the castle looms above you from a rocky crag. Dawyck is one of the world's finest arboreta. Trees from all over the world have been nurtured in this woodland garden including a mighty silver fir planted in 1680. There are treasures to see in every season, from swathes of snowdrops and daffodils in early spring to spectacular displays of azaleas and rhododendrons in early summer. The ever-changing kaleidoscope of seasonal tones culminates in autumn, when the Garden’s foliage provides a sensational backdrop of colour. To give you a flavour of the Garden, follow the yellow trail, then relax over a coffee in the award-winning visitor centre. Talla Reservoir extends along a picturesque valley surrounded by breathtaking scenery. Opened in 1899, the reservoir was designed to supply Edinburgh with water, which flows by gravity through a 28-mile (45-km) aqueduct. To your left (north) the highest hill in the Borders, Broad Law, towers above you at 2,756ft/840m, whilst to your right (south-southeast) the sheer side of Garelet Hill falls dramatically into the waters of the reservoir. As the road climbs towards Megget Reservoir, stop for a moment at a lay by to take in the spectacular views behind you. The road then follows rolling, open moorland before dropping down into the Yarrow Valley. At the heart of the Southern Upland Way lie the majestic lochs of St Mary’s and the Lowes. Rich in wildlife, heritage and culture, their dramatic beauty is a haven for photographers, walkers and cyclists. There are many paths and trails on which to stretch your legs, and in the summer months you might catch a glimpse of ospreys. Between the two lochs you can climb to the statue of poet and writer, James Hogg, the “Ettrick Shepherd” and friend of Sir Walter Scott, who was born just over the hill in the Ettrick valley. Dating back to 1107, Traquair prides itself on being the oldest continuously inhabited house in Scotland. Originally a hunting lodge for royalty, it became a refuge for Catholic priests during the Jacobite rebellion. Tour the house and explore the extensive grounds, including a large hedged maze, a playground of willow tunnels and an amazing yew circle. Look out for all kinds of wildlife including otters, deer and red squirrels. There are woodland trails around the house including Lady Louisa’s walk which takes you past the Quair water and on to the River Tweed.